Crazy Under Crisis: Hitting The Books.....Again! I've made the decision that I'm going back to study again. This means more late nights slumped at the key board, copious amounts of coffee, the occasional screaming, crying, stress induced hissy fit *yes I do throw them and I see exactly were Miss Moo gets it from when I do* plenty more assignments, numerous hours inside a classrooms, priceless achievements, flourishing confidence, new skills, placement time, fulfillment and career clarity. But I've done it before and I'm determined to do it again. 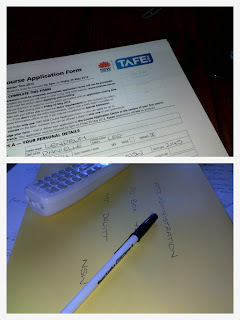 I've filled out my application, sealed it with hope and posted it off. Now its all a waiting game.